Creating a new paradigm for the body's collectively help programs. The human body and overall human experience are wired for certain propensities. These propensities can however be altered. 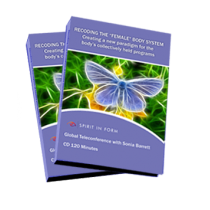 In this current paradigm of thought the female body has been operating under the control of certain protocols supported and held in place by belief systems. While science continues to step closer to the bottomless truth about the potentials of human existence we do not have to wait 100 years to begin to change such programs.